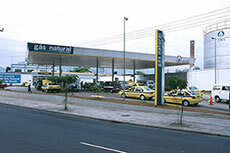 Gas Natural Fenosa (GNF) has opened a natural gas vehicle refuelling station in Alovera, Spain. The facility, located on the A-2, is part of the energy multinational’s strategy for creating a natural gas refuelling network along Spain’s main highways. 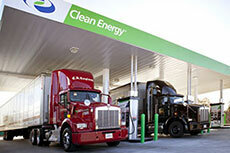 The Alovera service station can supply both CNG (compressed natural gas) and LNG. This new facility joins the 16 other service stations supplying LNG in Spain, making Spain the third country in the world in terms of the number of natural gas refuelling stations. The Alovera service station, which has a 60 m3 tank, can supply both LNG and CNG via a double dispenser. The station has an annual refuelling capacity of 12 000 LNG-powered lorries and 42 000 CNG-powered light vehicles. The Alovera service station is one of seven built in Spain as part of the European ‘Gas as an Alternative for Road Transport’ (GARneT) project led by GNF. The stations, installed along the main transport corridors, supply LNG and CNG to vehicles. GNF has 35 service stations in Spain, including both public and private stations, with a capacity to supply approximately 1000 GW hours/year. These stations serve the majority of the 4000 gas fuelled vehicles in Spain. A total of 21 Spanish provinces now have public natural gas supply stations including Madrid, Barcelona, Seville and Valencia. 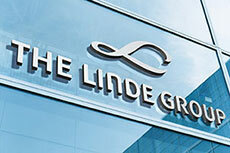 Linde will announce the start up of its new LNG fuelling station in Springville, Indiana, at the World LNG Fuels Conference 2014. The company has announced the opening of the first LNG fuelling station in Florida, as well as natural gas highway stations. 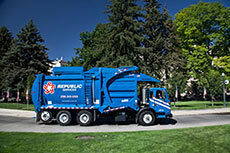 Republic Services announced the deployment of 79 CNG waste and recycling trucks in Indianapolis. Gas Natural Fenosa has opened a new station for liquefied natural gas fuelled vehicles in Motilla Palancar, Cuenca.